Gets the collection of key combinations that invoke an action using the keyboard. The collection of KeyboardAccelerator objects. Here we specify keyboard accelerators for a set of buttons (we specify a tooltip for Button1, which overrides the default keyboard accelerator display behavior). In this example, we specify keyboard accelerators for a set of MenuFlyoutItem and ToggleMenuFlyoutItem objects. The keyboard accelerator is displayed in the control's flyout. Control the presentation behavior by using the KeyboardAcceleratorPlacementMode property, which accepts two values: Auto or Hidden. In some cases, you might need to present a tooltip relative to another element (typically a container object). For example, a Pivot control that displays the tooltip for a PivotItem with the Pivot header. Here, we show how to use the KeyboardAcceleratorPlacementTarget property to display the keyboard accelerator key combination for a Save button with the Grid container instead of the button. As keyboard accelerators are not typically described directly in the UI of your UWP application, you can improve discoverability through tooltips, which display automatically when the user moves focus to, presses and holds, or hovers the mouse pointer over a control. The tooltip can identify whether a control has an associated keyboard accelerator and, if so, what the accelerator key combination is. Windows 10, version 1703, introduced keyboard accelerator shortcuts. However, these shortcuts were not displayed with the UI of their corresponding controls. 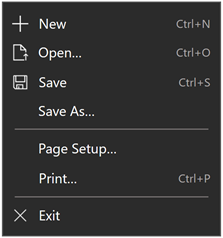 Starting with Windows 10, version 1803, when KeyboardAccelerators are declared, controls present the corresponding key combinations by default in a tooltip (unless they are associated with MenuFlyoutItem and ToggleMenuFlyoutItem objects). Specifying a tooltip overrides this behavior. For MenuFlyoutItem and ToggleMenuFlyoutItem) objects, the keyboard accelerator is displayed with the flyout text. If a control has more than one accelerator defined, the first registered accelerator is presented. Depending on the control, you can override the default key combination string associated with a keyboard accelerator using text override properties. SeeMenuFlyoutItem.KeyboardAcceleratorTextOverride, AppBarButton.KeyboardAcceleratorTextOverride, and AppBarToggleButton.KeyboardAcceleratorTextOverride. An accelerator key can be a single key, such as F1 - F12 and Esc, or a combination of keys (Ctrl + Shift + B, or Ctrl C) that invoke a command. They differ from access keys (mnemonics), which are typically modified with the Alt key and simply activate a command or control. An accelerator can be executed even if the element associated with the accelerator is not visible. For example, an item in the SecondaryCommands collection of the CommandBar can be invoked using an accelerator without expanding the overflow menu and displaying the element. By default, an accelerator has global scope. However, you can constrain scope using ScopeOwner or disable an accelerator completely using IsEnabled.